Nova Media wants to simplify the process of getting content from your Mac onto your digital picture frame. 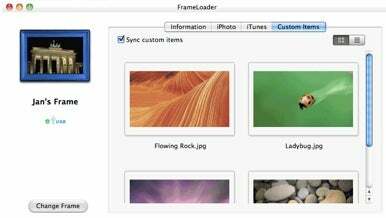 The software maker has released FrameLoader, which synchronizes digital picture frames with Mac OS X.
FrameLoader lets you sync your iPhoto albums, iTunes playlists, and custom media files with one click, and converts pictures, music and videos automatically into a format that can be displayed by your digital picture frame. When running, FrameLoader displays a list of your iPhoto albums and iTunes playlists, which you can check or uncheck to be synced. When you connect your digital frame to your Mac, FrameLoader automatically starts the synchronization process, and an activity monitor displays the details of the sync process. FrameLoader can also sync memory sticks and memory cards, and has the ability to sync multiple digital picture frames and memory sticks at the same time. Each devices sync settings are saved separately. FrameLoader is $15—a demo version is also available—and requires an Intel Mac running OS X 10.6.